The CDC-funded Project CHOICES was originally designed to target the prevention of alcohol-exposed pregnancies – and thus the risk of Fetal Alcohol Spectrum Disorder (FASD). Developed and tested in multiple settings and study sites, CHOICES: A program for Women about Choosing Healthy Behavior is an evidence-based intervention that increases motivation and commitment to reduce or stop drinking and/or use contraception effectively. HBRT’s Drs. Mary Velasquez and Kirk von Sternberg, have worked with CDC and a multisite investigative team to develop, test, manualize, implement, and disseminate CHOICES in diverse settings. The HBRT team has also adapted the intervention to address smoking, sexually transmitted disease, and other adverse health behaviors. Dr. Velasquez was principal investigator on “Project CHOICES: A Randomized Clinical Trial for Prevention of Fetal Alcohol Syndrome among High-Risk Women,” a four-year study completed in 2004. Their publication of research findings, “Preventing Alcohol-exposed Pregnancies: A Randomized Controlled Trial,” appeared in the January 2007 issue of the American Journal of Preventive Medicine, for which the research team received CDC’s prestigious Charles C. Shepard Science Award (June 2008). Dr. Velasquez was also principal investigator on the recently completed randomized clinical trial testing the efficacy of CHOICES Plus, their adapted intervention for prevention of both alcohol- and tobacco-exposed pregnancies; Dr. von Sternberg was co-principal investigator. CHOICES: A program for Women about Choosing Healthy Behavior – Facilitator Guide. 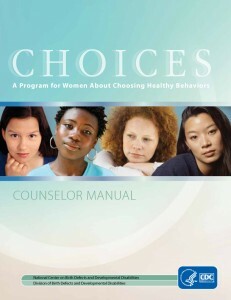 The CHOICES intervention is included in the National Registry of Evidence-Based Program and Practices and is being widely disseminated by the CDC and has been implemented in more than 30 sites across the United States, as well as in Canada, Russia, and South Africa.